MormonInfo.org - FAQs - Doesn't Revelation 14:6-7 prophesy of the angel Moroni? "And I saw another angel fly in the midst of heaven, having the everlasting gospel to preach unto them that dwell on the earth, and to every nation, and kindred, and tongue, and people, Saying with a loud voice, Fear God, and give glory to him; for the hour of his judgment is come: and worship him that made heaven, and earth, and the sea, and the fountains of waters" (Revelation 14:6-7). 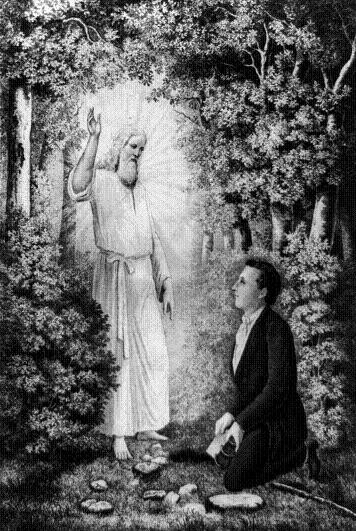 The angel Moroni showing Joseph Smith the gold platesLDS think this is an obvious reference to the angel Moroni, who supposedly appeared on several occasions to Joseph Smith beginning in 1823. When else did an angel preach this gospel to all people groups? However from a Christian standpoint, if this biblical passage refers to the nineteenth century, then when were the biblical events preceding this passage fulfilled (e.g., the killing of a third of mankind in 9:15)? Even if you want to spiritualize these events for the last 2,000 years, there is no good reason to think that the passage refers to the 1820s rather than some future date. It seems better that the passage is referring to some future angel right before Christ comes to establish His kingdom. Finally, Moroni’s gospel is false, since it contradicts the gospel of the New Testament, and the apostle of our Lord said, "I marvel that ye are so soon removed from him that called you into the grace of Christ unto another gospel: Which is not another; but there be some that trouble you, and would pervert the gospel of Christ. But though we, or an angel from heaven, preach any other gospel unto you than that which we have preached unto you, let him be accursed. As we said before, so say I now again, if any man preach any other gospel unto you than that ye have received, let him be accursed" (Galatians 1:6-9).